Tintin in the Land of the Soviets (Original: Tintin au pays des Soviets) is the first volume of The Adventures of Tintin comic series by Belgian cartoonist Hergé. This is a shameless political propaganda comic. Appointed by the preservationist Belgian daily paper Le Vingtième Siècle as against communist promulgation for its kids' supplement Le Petit Vingtième, it was serialized week after week from January 1929 to May 1. Later Herge was ashamed for this and this is the only completed Tintin story not to have appeared in color. Tintin is appointed by Le Petit to report on Soviet Russia. Tintin boards a train but after an explosion, Tintin is blamed for the bombing. As a fugitive he and his dog snowy goes to Russia and revels some shocking Bolshevik secrets. 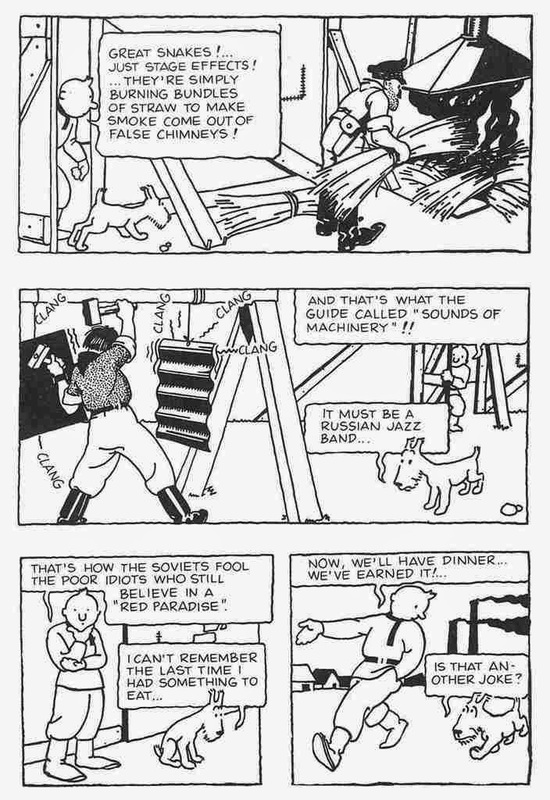 Here Hergé tried to show how bad Soviet Russia (and communism). He portrayed Russia as a poor country. Soviet government was doing all sort of evil including rigging elections, killing opponents and stealing the grain from the people. If you are favor of communism you probably not want to read the book!